There are a lot of other interesting tweaks as well, including chargeable moves, variable Persona HP bars, tweaked damage rates and character life bars, new combo restrictions and more. Not all of these are plainly visible to someone jumping into the game dry, but they certainly do make for a more balanced experience. Outside of the core gameplay itself, there are a lot of cool new modes in Ultimax. First of all, the story is incredibly long. Really, really long. Like over 20-30 hours long. Playing it puts you on a branching path of episodes that you can wander around and play at your leisure. Usually you’ll be given 10-15 minutes of talking before a match, with a character that you are forced to play. Depending on what you do in that match, the game progresses in different ways. Story mode, btw, is by default set to a “holy crap this is so easy” difficulty mode that is lower than what you would experience in every other mode in the game. It allows you to just progress through the story at your leisure without needing to flex your fighting game muscles much. There is also a new Golden Arena mode, which plays out kind of like an RPG. You choose a character and start going through dungeons, fighting opponent after opponent, and gaining levels. As you level up and increase your social link with a navigator of your choosing, you’ll increase your stats, and gain new passive skills to aid you in battle. It’s a lot like Soul Calibur’s goofy multi weapon arena modes, and it’s a fun little diversion. Unfortunately, the thing I was most excited about I can’t really review. Ultimax’s multiplayer online lobbies are basically set up like a virtual arcade. You control an avatar, walk up to a machine, place a quarter down and wait your turn, and so forth. It’s cool, but at time of writing the only people playing online were other game journalists so I really couldn’t tell you whether it works well or not. 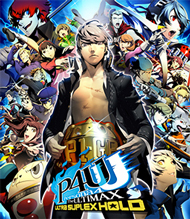 In the end, I think Persona 4 Arena Ultimax is a good game, well worth a purchase if you bought the original, and definitely worth a purchase if you didn’t. It’s a fun and balanced fighting game with a lot of nuances. It’s just very complicated and hard to get into if you are only a casual player, and the steps taken to make it easier to understand, like the “suplex hold” system, really only serve to complicate matters further. 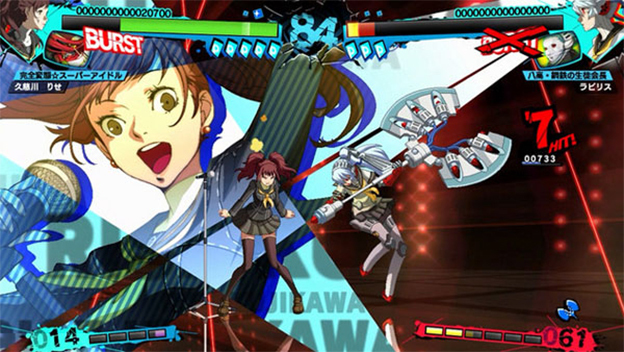 The sixty dollar price tag is a bit much to take, especially if you already spent sixty dollars on the original two years ago, but if Persona 4 Arena has been a staple in your fighting game library, Ultimax gives you more than enough content to satisfy you for another two years, and hopefully with patches and DLC it will get even better. It’s nice to see the rest of the Persona 3 cast join the fight. There are way, way, way too many button combinations to keep track of, and without an arcade stick you’ll quickly run out of space on the controller. Also combo timing is needlessly finicky. The English voice acting is ok, but I prefer to listen to the Japanese voice track. When it was first announced I was angry that I would have to purchase the game again, but it’s probably worth the sixty dollar price tag.